Utipulp statistics show BSKP consumption down by 1.4% from May but up by 2.3% when compared to June last year. Consumer inventories of market softwood pulp at the European paper mills are quite low and almost 7% lower than a year ago. The re-start of Södra’s Värö-mill in mid July brings additional volumes on the supply-side. The weaknesses reported from the Asian markets have not shown much in the European market but the rise of prices has stalled here as well. In fact, our PIX NBSK index moved down, even if by only 17 cents, or by 0.02%, and closed at 812.23 USD/tonne. With a 0.67% strengthening of the US dollar against the Euro (weekly average of week 29), the index value, after conversion into Euro, moved up fairly clearly, i.e. 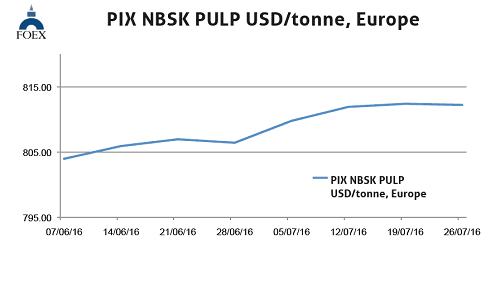 by 4.76 euros, or by 0.65%, and the July 26 PIX NBSK index value in euro-terms ended at 736.65 EUR/tonne. In BHKP, the market remains weaker than in softwood, partly due to increased market BHKP capacity, partly to persistently high producers’ stocks and partly by the declines seen in the graphic paper consumption and production which hits hardwood relatively more than softwood. On the other hand, the demand for market pulp for tissue continues to grow and in these products BHKP represents a higher and still growing share of the total furnish, especially as the declining supply and use of white recovered paper grades is typically replaced by BHKP. After several weeks of weak BHKP pricing in China, the downward pressure has caught up with the European market as well in July, at least temporarily. Our PIX BHKP benchmark lost more than the NBSKP index as the hardwood index headed down by 4.08 dollars/tonne, or by 0.60%, and ended at 677.25 USD/tonne. In week 28, the value of Euro weakened by 0.67% against the US dollar (weekly average). When converting the USD-value into the clearly weaker Euro, the July 26 BHKP benchmark value in Euro headed up by 42 cents, or by 0.07%, and the index in euro-terms closed at 614.23 EUR/tonne. 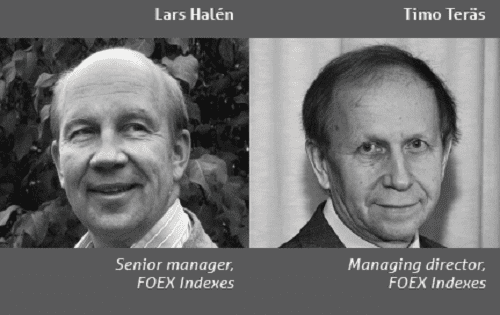 At the time of writing these notes, the so far released data on the paper industry activity in June has been predominantly disappointing even if for instance the US manufacturing index ISM’s sectorial numbers placed printing and related support industries and paper production high on the list on best industry performers. The US packaging sector data was positive as far as box shipments and inventory positions were concerned but the box and containerboard production data was less impressive with an about 1.2% decrease, year-on-year. US boxboard was down, too, by 2% against June 2015. Data released by PPPC over the June printing and writing paper shipments was weak in both North America and Europe. Total printing and writing paper shipments from North American sources were down by about 6%, year-on-year. Inventories moved up by 2% from end-May. The largest grade, uncoated free sheet, showed a 5% drop in shipments. In Europe, June graphic paper shipments, including newsprint, were down by over 7%, year-on-year. Regional demand was down clearly less, or by 3.8% as the 12% retreat in exports outside the region accounted for a fair part of the fall in total shipments. These June data were worse than the cumulative performance. The first half 2016 graphic paper total shipments were down by 5.4%, regional demand by 3.3% and exports by just over 9%. Newsprint and uncoated printing and writing paper grades show more modest declines than the coated grades. In newsprint, the estimated regional demand was actually up in June against June 2015. Share the post "PIX Pulp indices 26.7.2016"